After spending the day hanging around the campground on Saturday, I was raring to go on Sunday morning. Everything seemed to fall into place. The weather had finally broken, and the heat and humidity were much less intense than they had been all week. It felt great to be out on the road again. 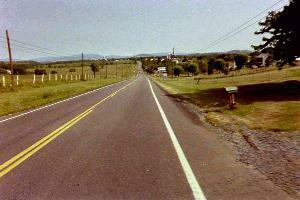 Coming into Staunton from the south, there are a few miles where Route 11 becomes a typical suburban strip-mall route. Since it was Sunday morning, most of the stores were closed, and the traffic was consequently very ligjht. I noticed a restaurant that seemed to be the place locals stopped for breakfast either before or after church. The waitress here actually brought me an extra plate of pancakes (oops! they're called hotcakes in Virginia), and pretty much ordered me to finish them off. I did the best I could, but the very last one in the second stack defeated me. I followed Business 11 through downtown Staunton, instead of taking the newer route which bypasses the downtown area. There are some beautiful homes as one heads north out of Staunton. Once past Staunton, the valley opens up into some truly beautiful open farm country. The terrain here is more gentle that it is further up the valley (south). I was able to climb most of the uphill sections in my middle chainring. Since I'm a truly terrible climber, the hills must really be gentle for this to be true. Today was turning into one of those rare but memorable days when everything goes right. I was feeling strong. The miles were rolling by effortlessly. A couple turning into the parking lot of their church smiled and waved as I rode past. An idea was starting to form in the recesses of my endorphin-filled brain. I made regular stops to eat, drink, and rest. Still, the miles were melting away with ease. Soon enough, I was rolling into New Market. It was only just past noon, and I had already traveled the 50+ miles scheduled for the day. The germ of an idea that had been lurking in my mind finally burst out in all its glory. Stop now? Never! I stopped at a convenience store just past the center of town. I stocked up with a couple of fresh bananas, a bottle of Gatorade, and some delicious fudge brownies (health food! ), and filled both water bottles. After chatting with the woman behind the counter for a few minutes, I was back on the road. The smile on my face was getting bigger. I felt truly audacious. I had just decided that I wasn't going to stop until I got to Front Royal! It was another 20 miles to the town of Edinburg. Here, I stopped at another small store to stock up on yet more fudge brownies! I also topped off my water bottles for the last time. I was starting to get a bit worried now. Was I being foolish? I already had 75 miles on the odometer, more than I've ever ridden before in a day. I estimated it was another 30 miles to Front Royal. Was I really going to make it? If I did, would I enjoy it, or would it turn into drudgery and spoil what had so far been my ultimate cycle-touring day? Still, I had made my decision, and was committed. I soon made the turn east for the climb up Edinburg Gap, and into the southern end of Fort Valley. The climb was steep, and quite interesting as it made switchbacks around the head of the stream flowing down through the gap. I walked the steeper parts of the climb, and was at the head of the Gap before I had expected to be. 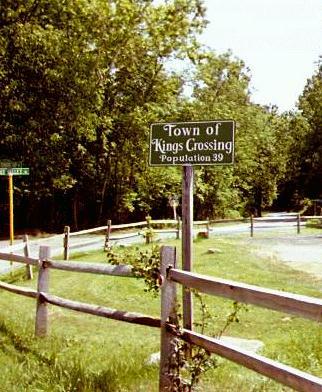 I coasted down to the intersection at King's Crossing, where I turned south again for the ride down Fort Valley. Fort Valley is a truly beautiful place. Massanutten Mountain splits the Shenandoah Valley in half, forcing the Shenandoah River into a North Fork and a South Fork. High within the embrace of Massanutten Mountain lies tiny Fort Valley. The valley is reached by the steep climb up Edinburg Gap at its southern end, and through a tiny break in the rampart walls at its northern end, through which a stream flows. While General George Washington was camped at Valley Forge during that winter of the Revolutionary War that is so well known to every American school child, he had formulated a plan in case the British continued to dominate the war. If it appeared that defeat was imminent, Washington decided that his Continental Army would retreat to Fort Valley to make its last stand. It is my understanding that the only access into the valley at that time was by traveling up the stream that flowed out the northern end of the valley. A true natural fortress. The valley I traveled through was certainly peaceful today. It was like traveling back in time. It was quiet and pastoral. Since I was traveling down the valley, the cycling was easy. I relaxed both in body and in mind. It was then that I heard the horn blaring, at least 100 yards behind. The car quickly pulled even, then slowed. While the driver continued to lean on his horn, he turned and screamed something totally unintelligible at me. He apparently didn't have sense enough to roll down his windows before screaming. Then he started to ease right, attempting to force me off the road. I had already decided that I wasn't going to go off into the ditch unless he actually hit me. I wanted to make sure there was some physical evidence for the police. Therefore, I held my position, and tried to look as calm as was possible under the circumstances. When he realized I wasn't going to do what he wanted, the driver flipped me the one-fingered salute, screamed something at me again, and sped off. Whew! I calmed and consoled myself by thinking what a pitiful life this guy must have if he has to resort to such stunts to make himself feel powerful and important. The rest of the trip down the valley was much more enjoyable. The valley narrowed as I approached its northern end, and the landscape changed from open farmland to forest. 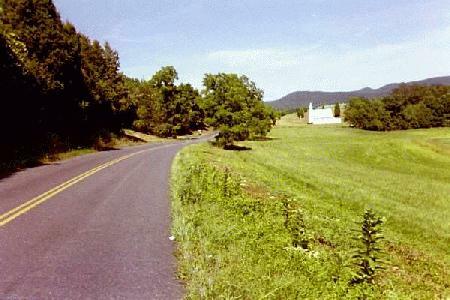 In fact, this end of the valley is part of the George Washington National Forest. Soon the road was following tightly along the banks of the stream. Finally, I passed through the small opening in the walls of the valley. I was definitely starting to feel the miles in my legs now. I turned east towards Front Royal. I was tired enough to be disappointed that the road was not downhill from here. Still, I was nowhere near running on empty. After a few more miles, I reached the intersection with Route 340. I turned north towards Front Royal, and quickly drew even with the turn into the Skyline Drive which I had started up 7 days before. From here, it was a slow ride through downtown Front Royal, and up the hill into the northern end of town. I pulled up to the motel from which I had started my trip, leaned my bike against the wall, and walked into the office. When I was here last weekend, I had dealt only with Debbie. I guessed the man behind the counter today must be her husband. As I walked in, he said, "You must be the blue truck bicycle guy. How did your ride go?"